West Bengal Police Recruitment Board has issued latest recruitment notification to recruit 4284 Constable posts. Candidates who are waiting for constable posts and eligible candidates they can apply online mode or offline mode by visiting official site of West Bengal Police before last date. 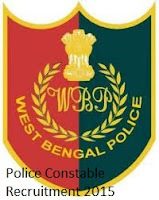 Also check other details related to WB Police Constable Notification 2015 like how to apply, selection process, height, running race, syllabus, events, application fee and other details you can check in the WP Police website.